Exactly one year ago I published my first post on this blog. 64 posts later I’m very pleased that I have been able to keep it up this long and still have the motivation to write more. I have enjoyed having an outlet to express my ideas and I hope some of you have enjoyed reading them. In honor of the first anniversary, I thought I would highlight my top 5 favorite posts from the past year. 5. Why Do We Love Football? The award for the most fun I’ve had writing a post on this blog probably goes to this post on football. Is there some hyperbole? Well, maybe just a bit, but I still stand by my comparison of Tom Brady and Mozart. My most read post of the last year thanks to retweets by Noah Smith and Steve Keen. Roger Farmer wasn’t too pleased with it, but Steve Keen seemed to like it. I think it provides a pretty good argument for why DSGE models should not be the only option for macroeconomic research. A relatively short post, but I think it’s also one of the most interesting. If you’ve seen graphs showing a growing gap between worker compensation and productivity, please read this post before you start coming up with crazy stories about exploitation of workers. This post on why I don’t believe in free will was one of my first, but I still think it is one of my best written. Libertarians perhaps unfairly often get lumped in with a republican party that is an absolute mess right now. A recent book alleges libertarians are just conspirators trying to overthrow democracy for the benefit of the wealthy elite. I think it’s fair to say that the reputation of libertarians is not exactly at a high point. Hopefully this post shows that that characterization is misplaced. Libertarians have many of the same goals as progressives and conservatives. We all want the world to be a better place, we just have very different ideas on how to get there. Bonus: What’s Wrong With Modern Macro? You’d have to be a bit of a masochist to make it through this riveting 15 part series on the problems with modern macro, but I can’t finish this post without at least mentioning it. I expect my pace of blogging will be a bit slower in year 2 as I need to ramp up my actual research efforts (which I may also tie in to some future posts), but I definitely plan to continue writing as much as I can. Thanks to anybody who has read and commented so far. I hope you’ll stick around for another year. One of the economic concepts that is most frequently misunderstood by non-economists (and probably by economists too) is the trade deficit. First, a definition. The trade deficit refers to the difference between the amount of goods a country imports and the amount it exports. As the graph below shows, the US has had a large trade deficit for the past several decades. It has been importing goods at a much higher rate than it has been exporting them. Nobody disagrees with that definition or that fact. The debate comes in when people start to decide whether this situation is actually a problem. This statement is complete nonsense. The trade deficit with South Korea or any other country has absolutely nothing to do with the US government’s $20 trillion debt. The debt is the consequence of perennial budget deficits that derive from the US spending a ton of money on military, social welfare, and other government programs. The trade deficit isn’t really a debt at all. It simply represents the fact that the US buys more goods from foreign countries than they buy from us. In the short run, a trade deficit is almost certainly beneficial for the US. As Milton Friedman eloquently explains in a video I posted a while ago, what a trade deficit really means is that foreigners are giving us real goods and services in exchange for pieces of paper. We get TVs from Japan. All they get are US dollars. However, a more careful criticism of trade deficits recognizes that trade deficits can be good for the country in the short run, but represent a cost in the long run. Noah Smith articulates such a point in this post, where he argues that the trade deficit is a “loan of real goods and services.” He gives the example of somebody in the US buying a car from Germany. If the US citizen pays in dollars, he calls this an IOU to Germany. At some point, a German will use the dollars to buy goods and services from the US. Even if the dollars were used to buy an asset like a stock, eventually that stock will be sold and the dollars from the sale will be used to buy goods and services. His logic makes sense. Every dollar must eventually come back to the US in some form or another at some point. But thinking of the trade deficit as a debt seems to me to be either misleading or completely wrong. One confusing point here is that the trade deficit is a flow, while debts are stocks. What is the value of the debt the US has to repay? 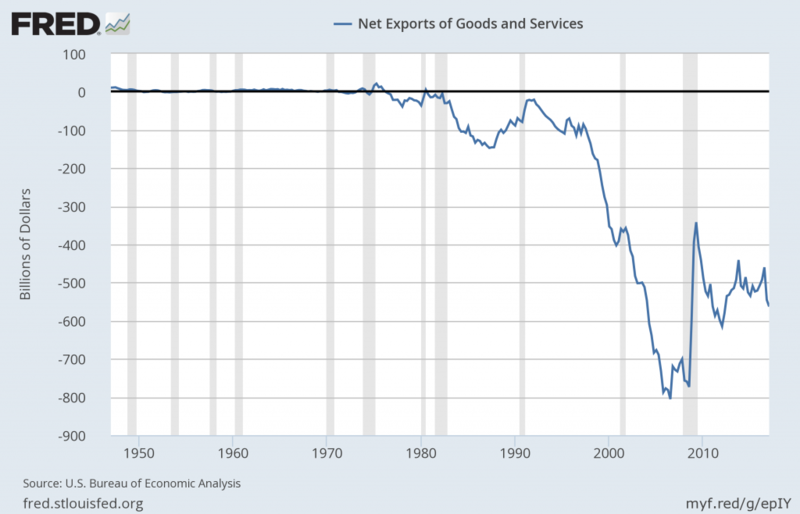 The stock of all goods and services ever imported minus all goods ever exported? The current stock of foreign dollar holdings? I’m not sure there is any consistent definition of what this debt is that we are supposed to repay. Even if there were, I don’t think the idea of the trade deficit as a debt is meaningful. Let’s flip Noah’s story. Assume a Chinese citizen really wants to buy Apple stock since they think it will increase in value. They need dollars to buy Apple stock so they exchange some Yuan for dollars and buy stock. At the same time, Apple needs to buy parts from China to make iPhones, so it imports them, trading dollars for Yuan in the process. For simplicity, assume these two transactions exactly cancel out. Where are the IOUs here? Does either country owe a debt to the other? It certainly doesn’t seem like it to me. The stock of dollars and Yuan in either country is exactly the same as it was before the transaction. It is even clearer that the trade deficit is not a debt if we consider what happens if Apple suddenly goes out of business. The value of their stock goes to zero and their imports also go to zero. The trade deficit that was created by Apple is gone and no US goods were ever given to China. I imagine Noah considers that analogous to defaulting on a debt, but I don’t buy that analogy at all. Does he think Apple owes a debt to all of its shareholders or just its foreign ones? Isn’t the risk of Apple’s stock price falling inherent in its purchase? If you still aren’t convinced, Daniel Ikenson also has an excellent rebuttal to Noah’s article. The other important point to keep in mind that is implicit in the example above is that foreign countries don’t just buy goods and services from the US. They also buy assets (stocks, bonds, etc.) or invest directly by building their own factories and capital equipment here. The current account (goods and services) and the capital account (assets) are always in balance by definition. A current account deficit is always offset by a capital account surplus. This fact means that there are two ways we can frame the US’s large trade deficit. It could be that Trump is correct and we are really just falling behind in competitiveness. Nobody wants US goods anymore so they don’t buy our exports while we eat up their imports (which again is not necessarily bad – we get goods and they get paper). Or it could be that the US is home to many of the safest and best performing assets in the world. Other countries are dying to invest in US companies (and treasury bonds) and the result is a huge capital account surplus. One statistic won’t tell us which story is more accurate, but I think it’s pretty safe to say that we don’t have to be too worried (either now or in the future) about the trade deficit.